May 3, 2018 By Allyson 31 Comments This post may contain affiliate links. Read my disclosure policy. With only THREE ingredients, Fresh watermelon, lime, and tequila blend together perfectly in these delicious summery Watermelon Margaritas! One thing I love about summer is summer cocktails (including watermelon margaritas!). BBQ’s, cookouts, potlucks…wherever you are going, a margarita is appropriate. Usually I love making margaritas with berries (love these Super Easy Strawberry Basil Margaritas), but since watermelon is everywhere during this time of year, I decided to switch it up. Mixing sweet watermelon with lime flavors and alcohol, is a winning combination. 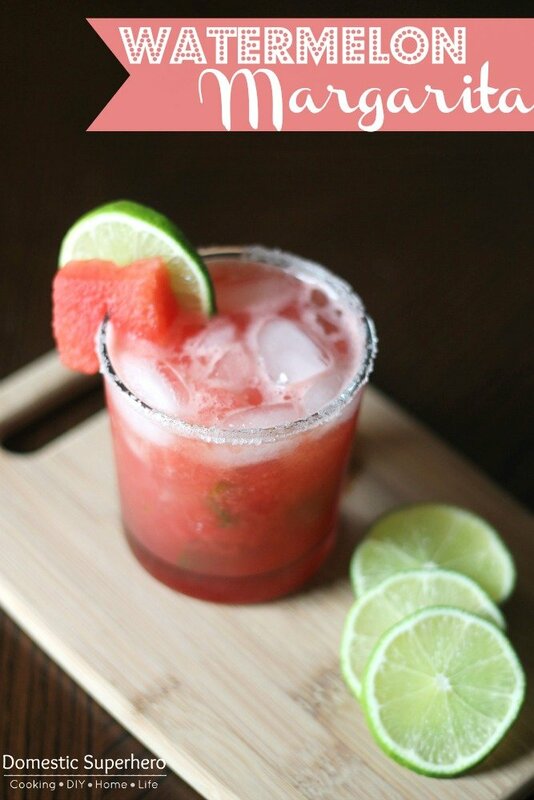 These easy watermelon margaritas can be served on the rocks (my favorite!) or blended! Cut up a fresh watermelon. You are going to need 4 cups of watermelon separated from the rind. Using a high powered blender, add watermelon, limeade, water, and tequila to the container – let her rip! Let the mixture sit. Place the blender container in the fridge and leave it at least an hour. Can I use a different alcohol for this margarita? Sure! It won’t technically be a margarita then, but feel free to use vodka, rum, or gin – I think they would all be refreshing! Can I make these Watermelon Margaritas for 2 people? How about a crowd? Absolutely. See the recipe card below on how to make watermelon margaritas for a few people, or a crowd of people. I actually preferred the version made in the pitcher, with the frozen limeade, however the shaker version was good as well. 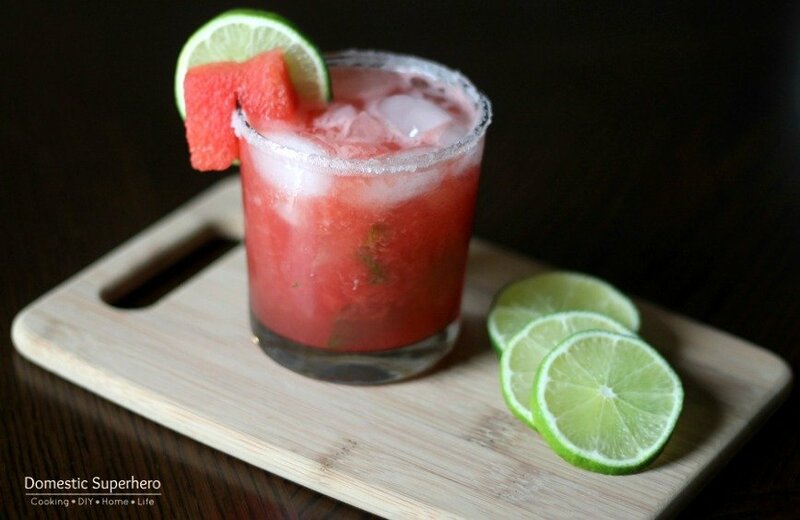 TIP: The watermelon really soaks up the tequila here, so make sure to eat those for a boozy treat! Strawberry Basil Margarita Popsicles are not only boozy and delicious, but they are simple to make! Everyone is going to be begging for them this summer! Strawberry Moscow Mules– a spin on traditional Moscow Mules: Ginger Beer, Lime, Vodka, & Strawberries make the perfect combination for this warm weather drink! Pineapple Mojitos are full of fresh pineapple, mint, and lime! They are bursting with flavor and make the best summer cocktail! Place watermelon into a blender. Add limeade, water, and tequila. Blend until smooth. Pour into pitcher and add lime rounds. Dip rims of glasses into salt or sugar before serving. Before serving stir well and pour over ice to serve. In a blender add all ingredients except extra lime for garnish. Blend on high speed for about 30 seconds. Dip rims of glasses into salt or sugar. Pour into 2 glasses, garnish with lime wedges and serve. Wowza that looks yummy! I love margaritas, but I’ve never had a watermelon one. Pinned this – can’t wait to try it – thanks for sharing! Yummmm! I LOVE margaritas! I think I need to try these! Pinning to my “Drinks” board. Thanks for sharing at Pinworthy Projects. They are!! Totally a refreshing treat! Allyson this drink looks delicious and the pictures are so pretty! Thank You for sharing! This is the perfect drink for the perfect Fiesta! Thanks for coming by, Lizy! Tonight I am drinking white wine, but oh man, I really want to make that!! I am excited about your giveaway also-I will come back. I am giving you a pin so I don’t forget this recipe! Thanks Jennifer! The giveaway is up and running here: https://domesticsuperhero.com/2013/07/08/giveaway-camarena-tequila-tipple-tool-box/ Come on by and enter! i have to try this ASAP. looks amaazing. They are super delicious! Thanks for coming by! 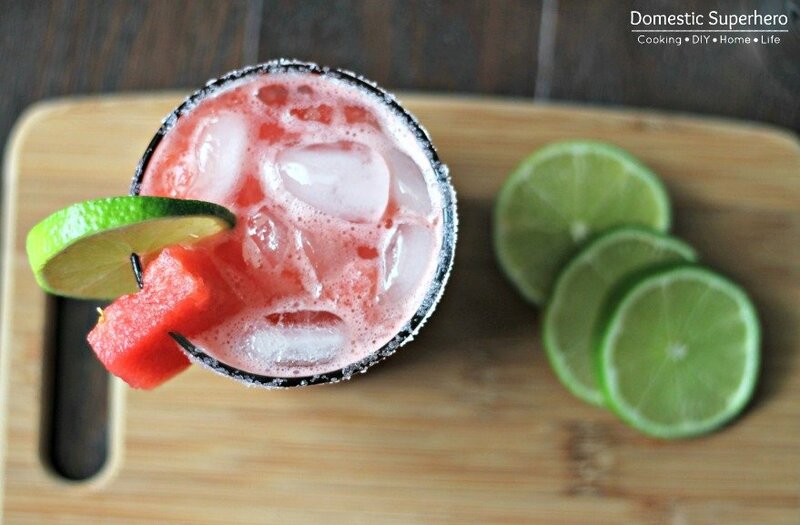 Ooh I love watermelon and these margaritas look great! Pinning, and these are also featured in my roundup of 25 Refreshing Summer Cocktails!